Slice of Pi Quilts: Christmas Quilt-A-Long starts August 1st! Do you love trying new things and learning new techniques? Do you want to meet some new quilty friends? Would you like to finish a Christmas quilt BEFORE Christmas? 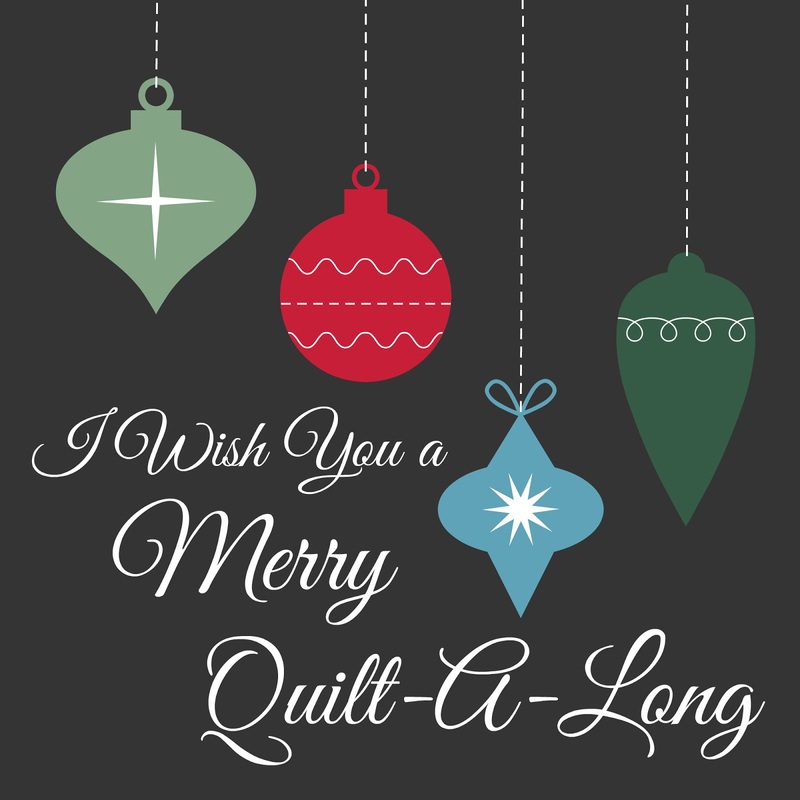 Then you should join me and a dozen bloggers for the "I Wish You a Merry Quilt-A-Long!" The quilt-a-long (QAL) starts August 1st. Every other Tuesday, a new FREE 12" quilt block pattern and tutorial will be released. If you complete the block before the next pattern release, then you will be entered to win some AMAZING prizes! There are bi-weekly prizes and a mega grand prize too! In addition, some bloggers will be sewing along and making every block too! These quilt-a-long hosts will share tips and tricks for each block, plus you'll get to see the same block in many different fabrics! These bloggers will be there every step of the way to encourage you to finish the quilt too! Still have questions? I've got answers! Do I have to make every block? No! This is laid back and meant to be fun! Make the ones you want! You will be eligible to win the bi-weekly prize for each block you complete. Can I join the party late? Yes! You will be eligible to win the bi-weekly prize only while that block is the current block. However, you can always go back and make the previous blocks at any time! At the end of the quilt along, everyone who makes a quilt top using all twelve of the blocks will be entered to win the grand prize! Is this for experienced quilters only? No! The quilt-a-long is for everybody! Every block is unique and uses various techniques. That's why we started a Facebook group - so we can all help each other be successful! Whether you're new or seasoned, I'm sure you'll find this an exciting and fun experience! Can I see the blocks beforehand? Nope! We are only releasing one block at a time. I know, I know. I'm a control freak too! Trust me, it will be worth it though! Who can participate? You! The bloggers are scattered all across the globe, so we hope to have participants from many countries around the world too! International participants are eligible for all the prizes too! Can I still participate if I'm not on Facebook? Absolutely! If you're on Instagram, use #iwishyouamerryqal to be entered to win. Each designer will also have a linky party on their block post so you can link up blog posts or Flickr photos. If you want to sew along, we will find a way! What are the prizes? There are so many! It's best to keep an eye on the Facebook group, as we will begin sharing the prizes there soon! 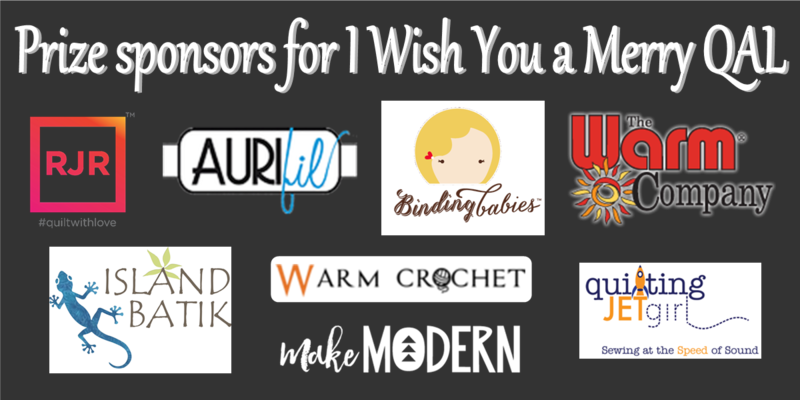 Just some of the prizes include patterns, batting and products from The Warm Co., thread from Aurifil, a gift certificate to The Fat Quarter Shop, signed quilt books, precuts, and much more! You won't want to miss a single week! How much fabric do I need? This is a little tricky. The blocks will each be 12" finished (12 1/2" unfinished) and there will be 12 blocks. You might be able to make the whole quilt from fabrics you have in your stash! I personally chose a limited color palette (red, green, turquoise, black, and white) and decided to play it safe with a yard of each. I will pick up fat quarters of other colors if I need them as I go. You will have two weeks to complete the first block. (And two weeks to complete future blocks too.) Hopefully that timeline will give you a chance to purchase additional fabric throughout the quilt-a-long if needed. If you plan to put your blocks together to make a quilt top, then I suggest 1 yard for sashing and 1 yard for a border. To finish the quilt, you will need 4 yards for backing (or 2 yards of extra-wide backing), a twin size batting, and 1/2 yard for binding. 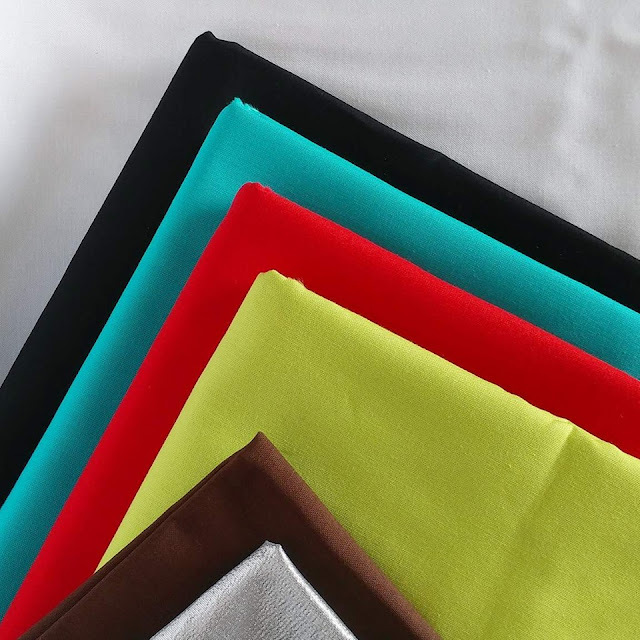 This post discusses fabric options a little more too. I'm using Moda Bella White 98 (because I always have a bolt on hand! ), Kona Black, Kona Breakers, Kona Lipstick, and Kona Cactus. I have a bit of Kona Chocolate and a metallic silver that I'll try and throw into a couple blocks too. Ok, I want to do it! Now what? Yay!! First, join the Facebook group so you'll know when each block is released. Second, gather the fabrics you might want to use for your quilt. The quilt-a-long starts August 1st! Lastly, invite your friends! Share the quilt-a-long graphic on Instagram and use #iwishyouamerryqal. Share this blog post or a post from the Facebook group on your own Facebook account and in your quilty groups. A party's more fun with friends! Linking up with Let's Bee Social at Sew Fresh Quilts, Needle and Thread Thursday at My Quilt Infatuation, Finished or Not Friday at Busy Hands Quilts, and Finish It Up Friday at Crazy Mom Quilts. Seeing everyone's posts is getting me super excited. I love your color choices! Looking forward to working along with you. That will be two Christmas quilts I'm doing at the same time! Oooh... a block every two weeks. Maybe I could do that... we'll see if I get my current QAL done before August. I've already joined the FB page Laura, I'm looking forward to it. Should we choose solids or will Christmas prints from our stash work? Should we have a certain amount of solids on hand. How much yardage would you recommend? I am late starting but so what!